Start Making Memories Around Your New Custom Dining Room. Our dining sets are heirloom-quality and handcrafted from solid-wood by highly skilled woodworkers. They are available in a variety of styles and timeless designs that match any decor. You customize the look with options including your choice of wood, finish and hardware. Each piece of furniture is exclusively built just for you using the highest quality materials and will last for generations. 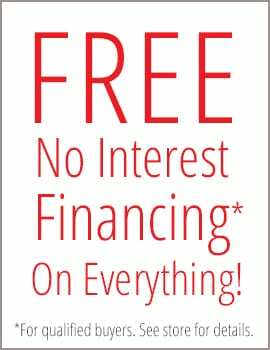 Stop in our showroom, e-mail or call us for an even greater selection. Also, check out our dining table and chairs to mix and match to make your own unique set. The Alberta Dining Set is great for formal or relaxed family get together. This is just one of our many Amish built dining tables to choose from. Select a solid top or one with leaves that adjust to fit a family of 2 to 22. Then mix and match it with some of the most comfortable seating options available. Choose your favorite wood and select from a wide variety of finishes to make it uniquely yours. Our durable finish makes your set resistant to even hot water and water rings. Plus, most have room to self- store leaves right in the table. Perfect for building generations of memories around the dinner table! The Bay Hill Dining Nook is just one of our many Amish built dining options to choose from. Create a cozy area for eating, conversation, or family game night. Benches come with or without optional storage space. Choose your favorite wood and select from a wide variety of finishes to make it uniquely your own. Our durable finish makes your set resistant to even hot water and water rings. Perfect for building generations of memories around the dinner table! 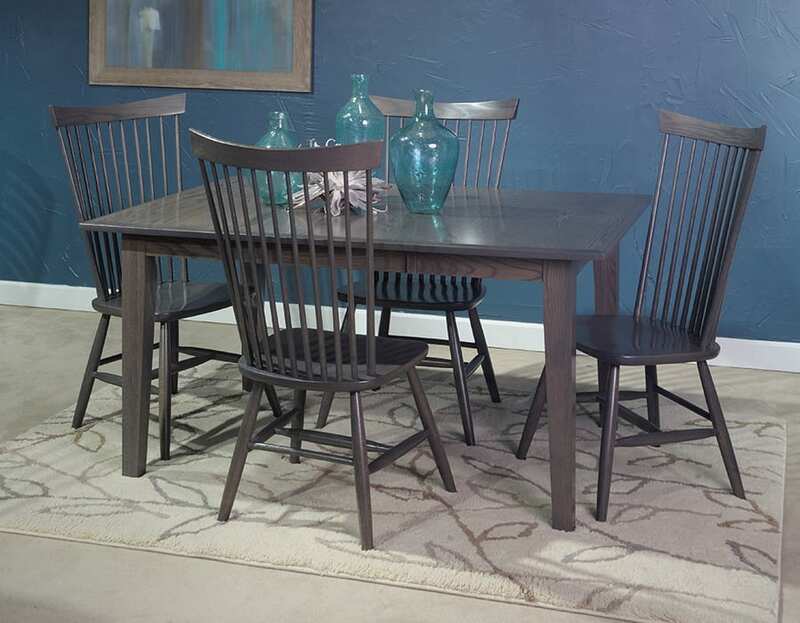 The Berkley Dining Set is great for formal or relaxed family get together. This is just one of our many Amish built dining tables to choose from. Select a solid top or one with leaves that adjust to fit a family of 2 to 22. Then mix and match it with some of the most comfortable seating options available. Choose your favorite wood and select from a wide variety of finishes to make it uniquely yours. Our durable finish makes your set resistant to even hot water and water rings. Plus, most have room to self- store leaves right in the table. Perfect for building generations of memories around the dinner table! Elegant enough for a formal special occasion, the Corabell Dining Set is also casual enough for a relaxed family get together. This is just one of our many Amish built dining tables to choose from. Select a solid top or one with leaves that adjust to fit a family of 2 to 22. Then mix and match it with some of the most comfortable seating options available. Choose your favorite wood and select from a wide variety of finishes to make it uniquely yours. Our durable finish makes your set resistant to even hot water and water rings. Plus, most have room to self- store leaves right in the table. Perfect for building generations of memories around the dinner table! 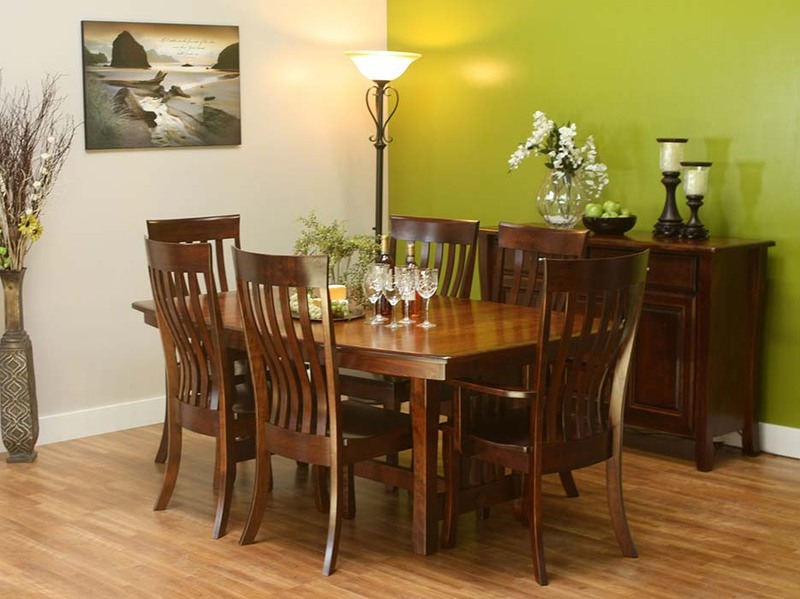 The Emerson Dining Set is great for formal or relaxed family get together. This is just one of our many Amish built dining tables to choose from. Select a solid top or one with leaves that adjust to fit a family of 2 to 22. Then mix and match it with some of the most comfortable seating options available. Choose your favorite wood and select from a wide variety of finishes to make it uniquely yours. Our durable finish makes your set resistant to even hot water and water rings. Plus, most have room to self- store leaves right in the table. Perfect for building generations of memories around the dinner table! 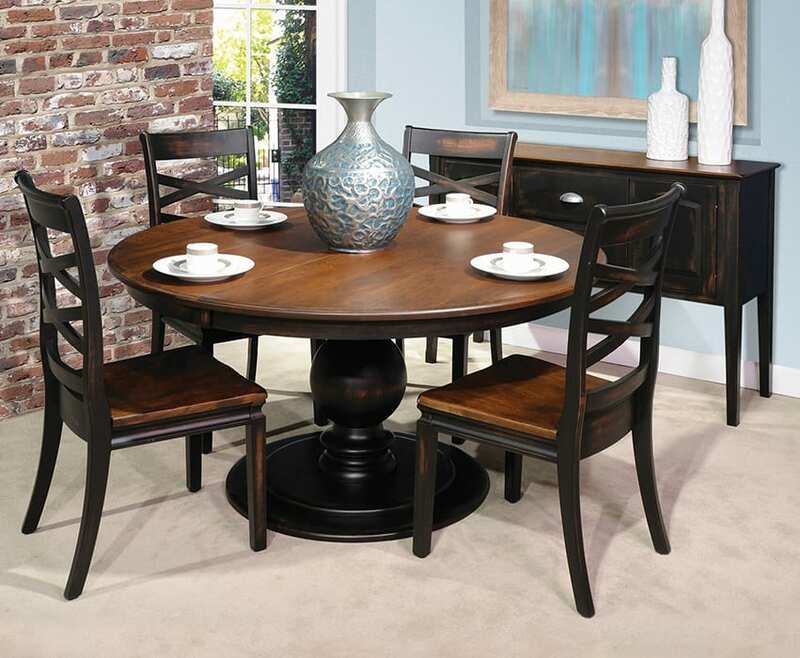 The Metro Dining Set is great for formal or relaxed family get together. This is just one of our many Amish built dining tables to choose from. Select a solid top or one with leaves that adjust to fit a family of 2 to 22. Then mix and match it with some of the most comfortable seating options available. Choose your favorite wood and select from a wide variety of finishes to make it uniquely yours. Our durable finish makes your set resistant to even hot water and water rings. Plus, most have room to self- store leaves right in the table. Perfect for building generations of memories around the dinner table! 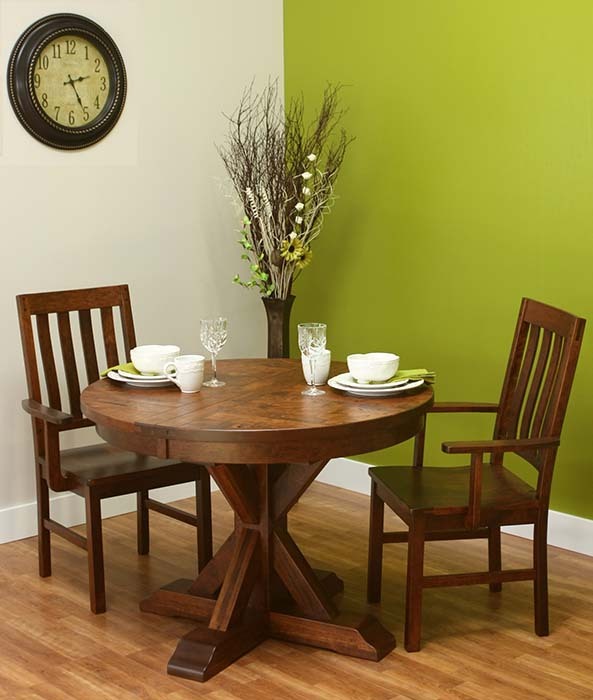 The Millwood Shaker Dining Set is great for formal or relaxed family get together. This is just one of our many Amish built dining tables to choose from. Select a solid top or one with leaves that adjust to fit a family of 2 to 22. Then mix and match it with some of the most comfortable seating options available. Choose your favorite wood and select from a wide variety of finishes to make it uniquely yours. Our durable finish makes your set resistant to even hot water and water rings. Plus, most have room to self- store leaves right in the table. Perfect for building generations of memories around the dinner table! The Napoleon Dining Set is great for formal or relaxed family get together. This is just one of our many Amish built dining tables to choose from. Select a solid top or one with leaves that adjust to fit a family of 2 to 22. Then mix and match it with some of the most comfortable seating options available. Choose your favorite wood and select from a wide variety of finishes to make it uniquely yours. Our durable finish makes your set resistant to even hot water and water rings. Plus, most have room to self- store leaves right in the table. Perfect for building generations of memories around the dinner table!